February 2, 2005 - Squashing out more fan art! Day three of Fan Art week has arrived. If you're a little behind, check out day 1 and day 2 to see all the fun you've missed. Today's fan art belongs to non other then Butternutsquash. BNS is crude, disturbing, brutal and unforgiving. In other words... it's perfect. 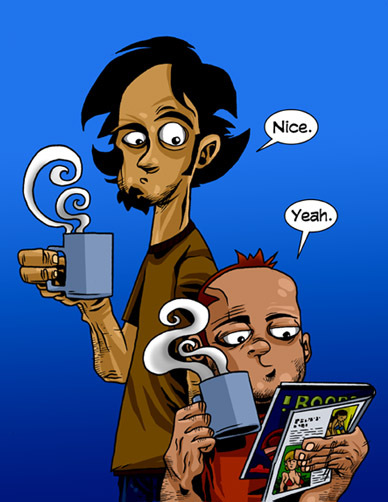 Cemented down by near perfect art, Ram?n and Rob roll out a comic that, at first glance, seems like most others. A group of friends that love hot coffee and hot chicks. But they pull no punches. They ask for no forgiveness. They spent a good month on a story arc about a "wanking sleeve". You say you don't know what that is? Prepare to be offended until your sides burst from laughing so hard. You'll be shocked for sure, but it's worth the trip. Check out Butternutsquash NOW! For more on Joe's BNS fan art, as well as the rest of this weeks pieces, head to this thread.